In this picture book about the life of the Báb, children ages six to ten have the opportunity to learn about a particularly fascinating period in the life of any divine Messenger — His childhood. Children and adults, too, may wonder what these extraordinary beings are like as children, and they may wish to learn something about the defining events that signal to those around them that these children are not ordinary children but rather endowed with innate knowledge and remarkable wisdom. In The Story of the Life of the Báb, Will van den Hoonaard gives readers the opportunity to learn about the Báb’s childhood by giving an account of some memorable incidents that took place when He was young and by offering information regarding His lineage, His homelife, His likes and dislikes, and some of His qualities. Clearly, the author’s goal is to acquaint children with the Báb and, as the title of the final chapter — “How close are you to the Báb?” — suggests, draw them into a closer relationship with Him. In two of the most intriguing of the 20 brief chapters in this picture book, the author tells us what the Báb’s voice sounded like and how He prayed. In other chapters, Van Den Hoonaard tells stories about the Báb at specific ages — five years old, nine years old, and ten years old. These stories give the young reader a point of reference for understanding the unique station of the Báb, a station apparent even at these young ages. The simple and, at times, lyrical text carries the story forward with grace, as in this passage: “His knowledge was like a hyacinth, a flower that maybe grows in your parents’ garden when there is no snow on the ground or after Spring has come. It has very small flowers but each flower gives off a beautiful perfume that is a thousand times bigger!” Rendered by New Brunswick artist Gloria Savoie, the captivating illustrations provide more than a context for the story. Deeply evocative and richly detailed, Savoie’s illustrations tell a story of their own. Certainly this book would not be what it is without the addition of Gloria Savoie’s magnificent art work. This book is modest in its scope: it aims only to convey a few facts and stories about the childhood of the Báb. 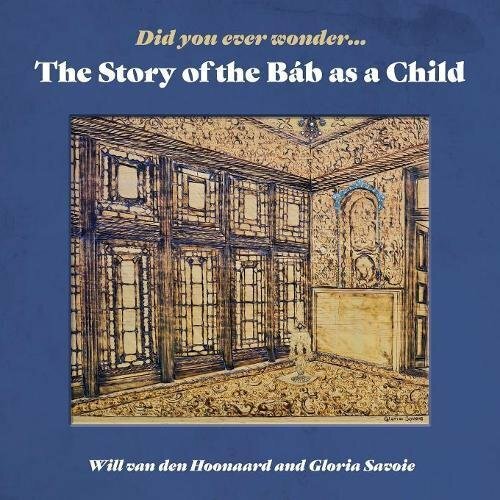 Yet Will van den Hoonaard and Gloria Savoie have made a genuine contribution to literature for children about the Central Figures of the Bahá’í Faith. Their book presents a selection of stories and facts about the Báb that, to my knowledge, cannot be found in any other picture book about Him. From the acknowledgements, we can glean that the author has engaged children in his community in the writing of this book, an inspired approach not only because of the valuable feedback such engagement would offer, but also because of the sense ownership it must have fostered in these children with respect to the fascinating tale of the Báb’s childhood. Thank you Will van den Hoonaard and Gloria Savoie for this wonderful little book. It will be well used by parents and long enjoyed by young readers.